So you’re ready to create a killer vlog, and you’ve got a list amazing ideas of tips that you could share. But it’s important to understand that vlogs are a marketing tool that should always point back to your business. 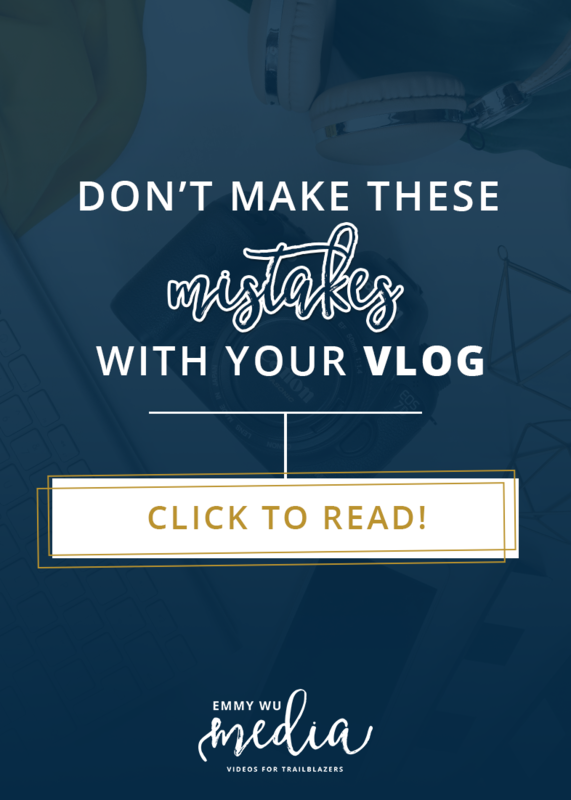 So before you run out and shoot your first hit or miss review, make sure that you’re not making these mistakes with your vlog, so you don’t waste tons of time and energy, and most importantly, make your vlog work FOR you as a lead-generator. We all know that content marketing is an essential ingredient for brand awareness and trust, but all too often, especially in blogs, the lines blur between our personal lives and the content we share for our viewers and readers. I know there are Youtube superstars out there who vlog while driving to the Laundromat or make a ton of money reviewing make up, but what you probably don’t know is that they’re often backed by large corporations who are smartly positioning themselves with these vloggers as a tool to attract new audiences. For regular online peeps like you and me, we need to be much more intentional with our content creation, so here are 3 important important mistakes that I don’t want you to be making. Not having content that points back to what your offers and services. What I mean is not including a pitch at the end of every video, but first getting really clear on who your target market is, and creating content that answers their specific questions. Take me for example, I work with online entrepreneurs who are serious about launching their offer into the world with a video launch series that will effectively convert their viewers into buyers. So ideal vlog topics would surround not just how to shoot videos, but specifically video launching strategies and positioning your video launch so it stands out and converts. The cool thing about creating content, is when you take the time to map out thoughtfully curated thoughts, you’re showing your ideal clients that you’re an expert that can help guide them because you’re presenting topics and answers they might not have even thought of. So dive a little deeper into your topics and your viewers (and prospective clients!) will thank you. Making your vlog about you and not your audience and ideal clients. Your vlog is a marketing tool, so use it wisely to speak to your audience about how you can help. For example, you could showcase client case studies and your process. Including your work in your blog is an amazing way for prospective clients to get a sneak peak on what it’s like to work with you and help them decide if you’re the right fit. By showing past case studies, you’re exposing your problem solving skills and what kind of results you were able to achieve for your clients. It’s a total non-salesy way to create a track record that speaks for itself. You’ll want to use these posts as almost a transformation case study: how you were able to take someone from A to B and how you are able to help others overcome obstacles along the way. Having too many scattered topics. This will take some careful planning to make sure that all your topics are cohesive and like I said before, point back (even if indirectly) to your offers and services. Start by creating maybe 4-6 general categories that all your post topics will fall under and keep it at that. IF you ever feel the urge to write something outside of this category, re-assess if it’s actually helpful for your brand, or if you can re-position it so it’s more aligned with your message. You want your vlog to be the go-to resource for your audience, and making sure you have strong topics that are organized neatly in distinct categories will ensure your vlog is more searchable and more helpful.